It’s dubbed as a "music and arts" festival after all, and this year organisers have padded out the Falls Festival program with plenty of off-stage options to round out your festival experience. Highlights include Book of Walls - an interactive "wild multi-art ride" that lets you contribute to an art film and the biggest book ever to be bound. Also, the "Baby One More Time" Dance Workshop lets you hone your hairbrush Brittney routine. There’s 10-minute discos every night driven by DJ Franfine in a shipping container, bringing a new hard and fast edge to the midnight mirror ball. Klassy Karaoke gives you the opportunity to slay the stage like your rock star heroes late in the night. Circus AF brings the hula hoops and trapeze. And the first day of festivities has a fancy dress option under a Meme Theme. Check the website for the full list of offerings. 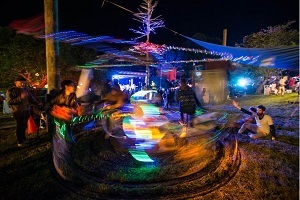 The Falls Festival runs Dec 28-31 in Lorne, Victoria. Head to the Old Bar for an art show unlike any other. See ten years of Celeste Potter art with live performances from Hachiku, Dark Fair and Radio Wonton. Tune in for State of the Art Wednesday March 27 when director Maude Davey chats about the Australian premiere of Dance Nation. Tune in for State of the Art Wednesday March 20 when Stephanie Lake chats about her latest dance piece - Skeleton Tree. Tune in for State of the Art Wednesday March 13 for Darren Sylvester's: Carve A Future, Devour Everything, Become Something exhibition discussion. Tune in to The Breakfast Spread Wednesday March 6 for State of The Art with World Problems' Emma Mary Hall. Before 1971, Australian censors cut and stored banned film frames from world cinema. Enter a forbidden archive at ACMI. Celebrate Indigenous culture with live music, dance, discussion, food and activities for all the family.